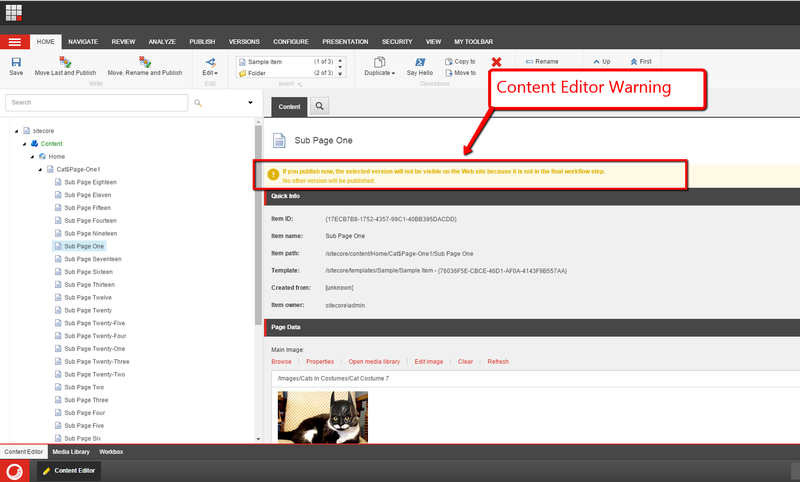 In my two previous posts — this post and this post — I used the Sitecore Rules Engine to determine how bucket folders in the Item Buckets feature should be constructed. I love having the freedom and flexibility to be able to do this. However, depending on how you generate these folder structures, you might end up with some pretty yucky — ahem, I mean “interesting” — URLs if you have Actions that generate nonsense bucket folder Item names for bucketed Items. However, we may not be able to always use this “out of the box” algorithm for whatever reason — who knows what requirements will make us do — so let’s explore some code that can clean up these yucky URLs. 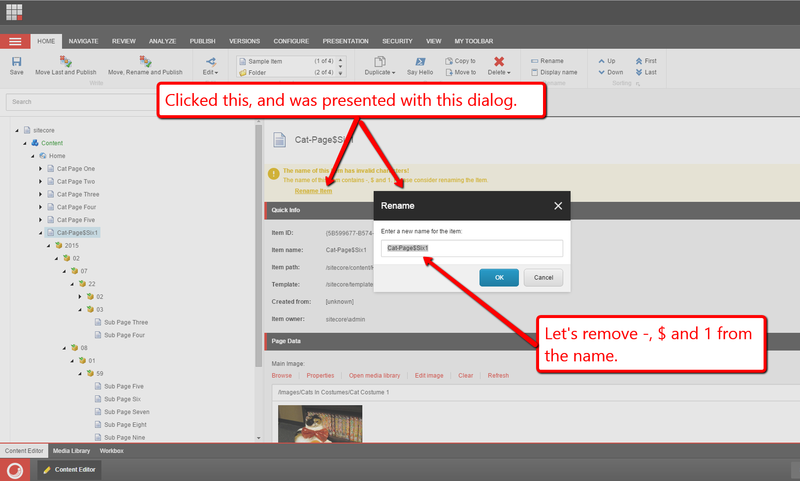 Let’s first tackle cleaning up the URL generated by the “out of the box” Sitecore.Links.LinkProvider class. I decided to implement a custom Sitecore pipeline to clean up the URL generated by the GetItemUrl() of the LinkProvider class, and will call this pipeline from a subclass of it (this code is further down in this post). If you’re going to create a custom pipeline, you’ll need an arguments object for it — this is technically known as a Parameter Object but I will stick with the name “arguments object” and “arguments class” for the class that these objects are instantiated from throughout this post. All subclasses must implement the abstract Process method above which takes in the arguments object with the class type defined above. The BucketedItem, DefaultUrl — this is the “default” URL generated by the GetItemUrl() method on the “out of the box” LinkProvider class, and GetItemUrl — this is a “pointer” to the GetItemUrl method on the LinkProvider class — properties are required by the custom pipeline when initially called, and these are checked here. The instance of the class above checks to see whether the bucketed Item is a descendant of an Item Bucket, and also sees if it is contained within a bucket folder. If one of these is not true, the pipeline is aborted. Code in the GetItemBucket() method uses the GetParentBucketItemOrParent() extension method of the Item class — this lives in the Sitecore.Buckets.Extensions namespace in Sitecore.Buckets.dll — to get the Item Bucket ancestor for the bucketed Item. If the Item returned is not an Item Bucket — this check is done in the IsItemBucket() method via another Item class extension method, the IsABucket() method, which also lives in the same namespace as the extension method mentioned above — then the pipeline is aborted. I’m not going to go too much into the details of all the code above. It is basically getting the web page name piece of the URL set in the DefaultUrl property on the arguments object, and appends it to the end of the URL of the Item Bucket without an extension (who uses extensions on URLs anyhow? ¯\_(ツ)_/¯ That’s like so 5 years ago. 😉 ). The resulting URL is set in the BucketedItemUrl property of the arguments object. I’ve extended the Initialize() method on the base LinkProvider class to read in the name of the custom pipeline (this is set in the patch configuration file further down in this post). The overridden GetItemUrl() method grabs the URL generated by the same method on the base class for the passed Item. If the custom pipeline’s name is set; the generated URL isn’t null or empty; and the item lives in a bucket folder, the custom pipeline is called with the required parameters set on the arguments object. If the custom pipeline generated a URL, it is returned to the caller. If not, the URL generated by the base class’ GetItemUrl() method is returned. You might be thinking “Excellent, Mike! We have code that fixes the issue. Are we done yet?” Not so fast, dear reader — we need write code so Sitecore can resolve these bucket-folder-less URLs. 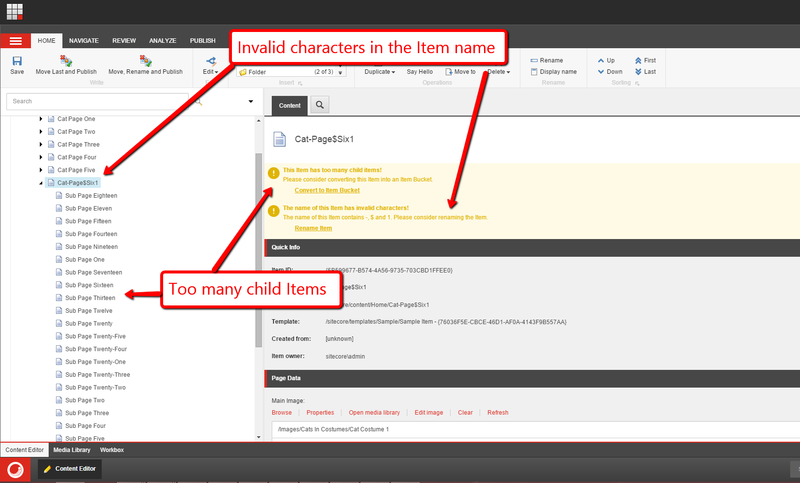 I’m leveraging the Sitecore.ContentSearch API in the class above to find a bucketed Item with a given name — this is passed as a parameter to the FindBucketedItemByName() method — which is a descendant of the passed Item Bucket. The GetSearchPredicate() method builds up a “predicate” which basically says “hey, we need an Item that is a descendant of the Item Bucket who is not a bucket folder; isn’t a child of the Item Bucket; isn’t the Item Bucket itself; and has a certain name (though we are ignoring case here)”, and is used by the Sitecore.ContentSearch API code in the FindBucketedItemByName() method. “Mike, what’s up with the two ISearchIndex instances on the above class?” I have defined two here: one for when we are in Preview mode — I’m using the master search index here — and the other for when we aren’t — this uses the web search index instead. 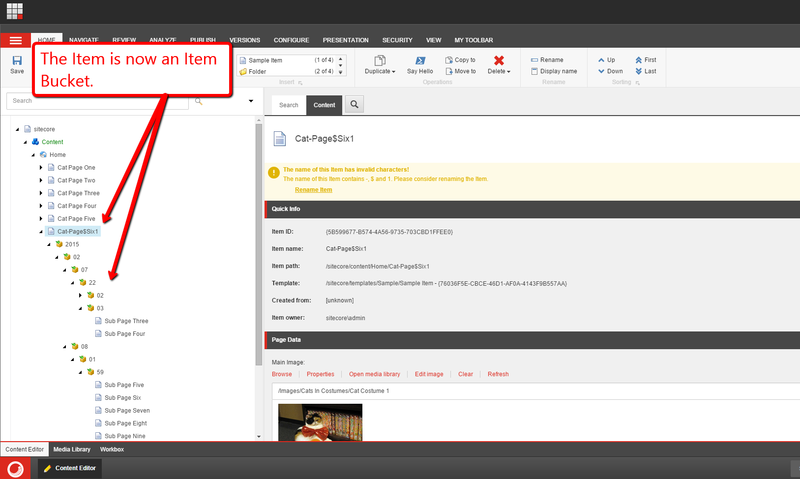 If results are found, we return the Item instance from the first result in the results collection to the caller. “Mike, could there ever be multiple Items returned?” Yes, this could happen if we have more than one bucketed Item with the same name, and only the first one in the results collection will be returned. In a future blog post, I will share a solution which will enforce unique Item names for bucketed Items. Now that we have code that can find a bucketed Item by name under an Item Bucket, we need a custom Item Resolver — this is just a custom <httpRequestBegin> pipeline processor — that uses an instance of the class above to set the context Item for these bucket-folder-less URLs. Not to go too much into all of the code above, the Process() method basically determines whether it should move forward on processing the request. When should it do that? If there isn’t already context Item set; the context Database is set; the request is being made in a targeted site — basically this is just a list of site names sourced in the patch configuration file below which is a list of websites we want this code to run in (we don’t want to this code to run in the “shell” website which is what the Sitecore Desktop and Content Editor use); and have an Item path, then the Process() method should continue. Other code in the Process() method is extracting out the parent’s page’s Item path; grabs an instance of the parent Item; determines whether it is an Item Bucket — if it’s not, then the code exits; the name of the page Item from URL; and then passes the parent Item and Item name to the FindBucketedItemByName() method which delegates to the FindBucketedItemByName() method on the IFindBucketedItemProvider instance to find the bucketed Item. If a bucketed Item was found, the Process() method sets this as the context Item. Otherwise, it just exits. I’m also using profiling code in the above class just as can be seen in the “out of the box” Sitecore.Pipelines.HttpRequest.ItemResolver class — this lives in Sitecore.Kernel.dll. If you don’t know what Item Buckets are — and if you don’t I recommend having a read of this pdf — they are Items that contain a nested structure of Bucket Folder Items, and the leaf Bucket Folder Items contain bucketable Items. One thing I’ve always been curious about was what code used the above setting to create path for these Bucket Folders — I wanted to see if I could override it, and add my own logic to name the Bucket Folder Items using some different algorithm. I found that this code lives in Sitecore.Buckets.Util.BucketFolderPathResolver in Sitecore.Buckets.dll. 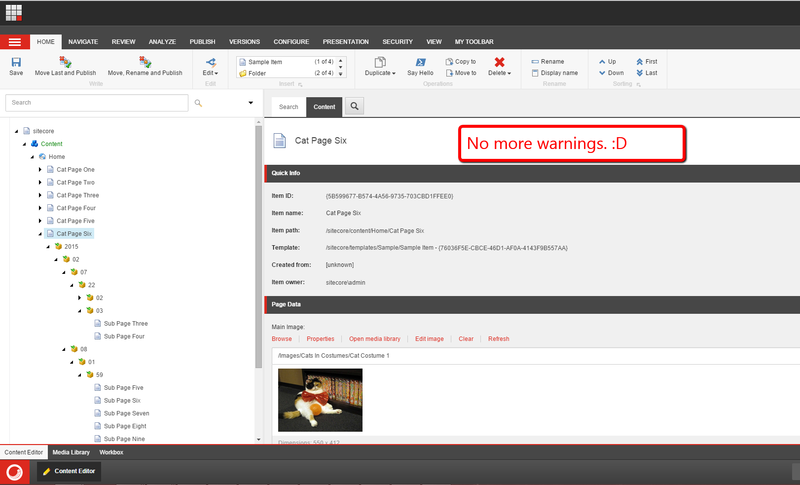 However, that wasn’t the only thing I saw in this class — I also saw code in there leveraging the Sitecore Rules Engine as well. Basically the Rules Engine code would execute first, and if it returned no path structure — as a string — the default DateTime format code would execute. 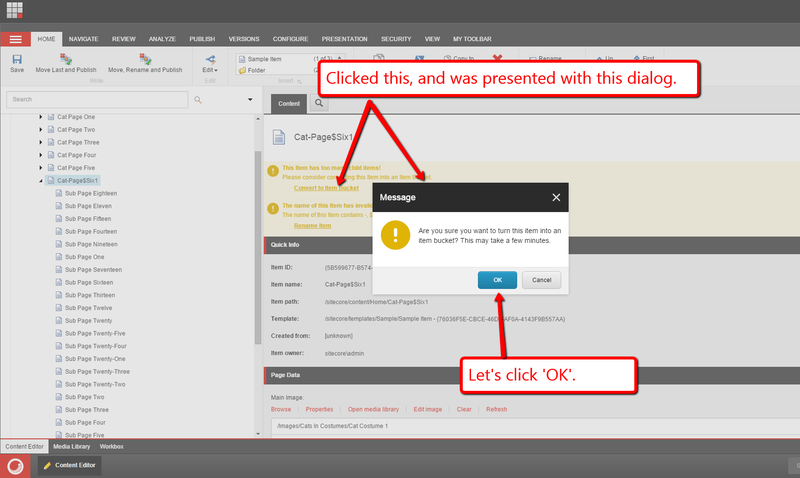 As an alternative method of discovery, I surfed through Sitecore.Buckets.dll to see how the existing Bucket conditions and actions were built, and then decided have a bit of fun: I created two custom conditions and one custom action. The Execute() method in the above class gets an instance of the Item Bucket from the BucketingRuleContext instance, and passes it off to the HasPresentation() method which determines whether the Item Bucket has any presentation components defined on it. The GetExcessiveNumberOfChildren() method tries to parse an integer from the value set on the Value property on the class instance. If the value is not set, it just returns zero. The above method is called by the ShouldExecute() method which ascertains whether the value is greater zero, and if it is, whether the Item Bucket has that amount of child Items or more. If both of these are true, the method returns true; false otherwise. The boolean value of the ShouldExecute() method is then returned to the caller via the Execute() method. The class above, in a nutshell, reads in the value that governs how deep the folder structure should be (i.e. this is stored in the Levels string property which is set on the rule further down in this post); tries to parse this as an integer (we can’t do much if it’s not an integer); creates N strings composed of random numbers between 100 and 999 with endpoints inclusive (N is the integer value of Levels); builds up a string delimited by “/” to create a folder path; and returns it to the caller of the Apply() method.